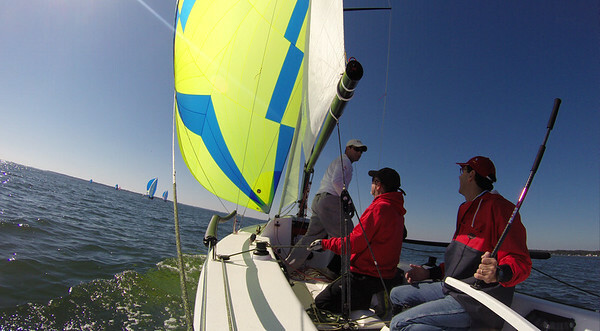 Fishing Bay Yacht Club held their inaugural J/70 Chesapeake Championship Regatta and I was sailing on Steve Q’s Hotty Toddy among the 18 boat fleet. The weather forecast for Saturday morning called for some pretty epic winds to move in and little did we know we’d all have some pretty epic sailing before the day was done. Racing was moved into Fishing Bay and even before we got there, boats were already broaching on there way there. 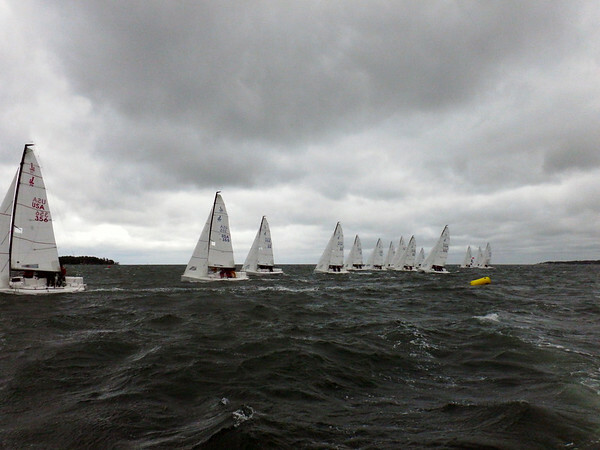 After 1 general recall the first race was started. The wind in the bay was blowing 25+ from the NNW so our course took us from Godfrey Bay, across the Piankatank River and around the windward mark on the western end of Fishing Bay. Sailing upwind in that kind of wind was a real slog. While we had heard from plenty of others how to sail in those conditions, actually doing it was another story and it definitely took us some time to get into a groove with it. 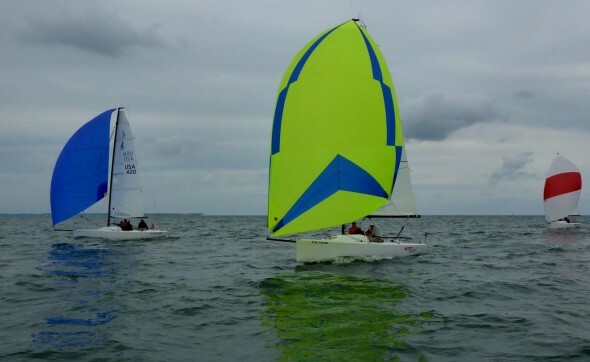 The teams that had clearly done it before easily pulled ahead in what was less about who was fast and more about who was upright especially when it came to the downwind. 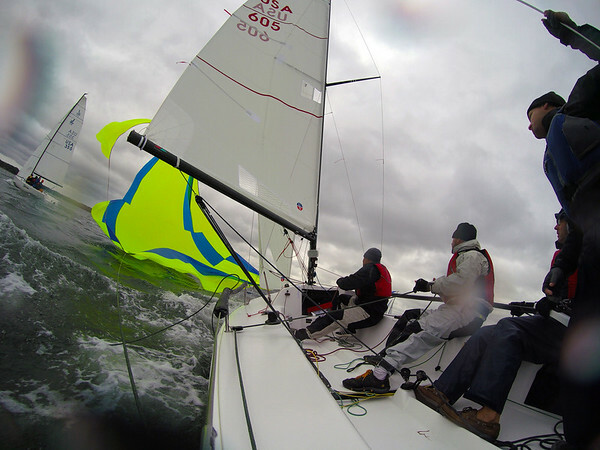 After two races in those conditions the race committee abandoned further racing for the day, and ultimately for the weekend. The slog home around Stove Point grueling with 5-6 foot waves and 40 knot gusts. We sailed under main alone with waves sometimes crashing over the boat. While we weren’t competitive in those conditions, we were happy to have had fun this weekend and learned a lot in the process. We’ll definitely be able to be a lot more competitive and comfortable with the conditions when they are up like that in the future. 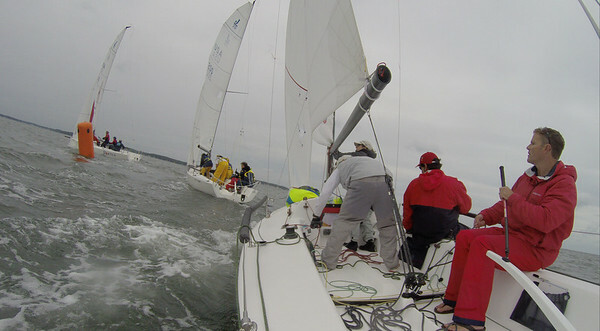 Thanks Steve Q for having me aboard and I enjoyed sailing with Jerry L and Tom F.
The final day of Fishing Bay Yacht Club‘s offshore fall series started out like it was going to be a nice sailing day, but didn’t last and the wind died before we could complete a race. 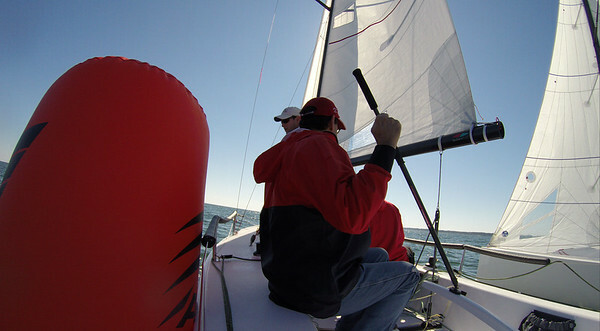 I was sailing on Steve Q’s Hotty Toddy with Larry and his son. Despite not finishing a race, we still had fun and learned a lot. 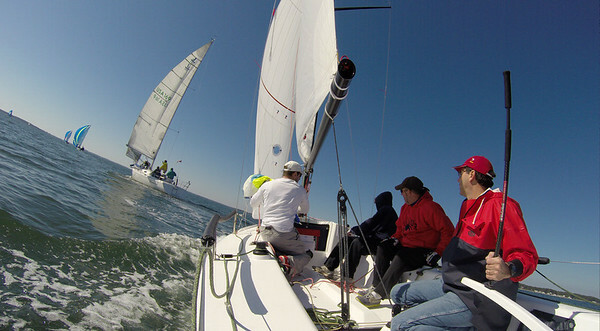 We’ll be back at it at FBYC’s inaugural J/70 Chesapeake Bay Championship regatta with 20+ boats on the line. Sunday’s race what was supposed to be the 3rd day in the FBYC Fall Series but due to some light wind some races were missed. 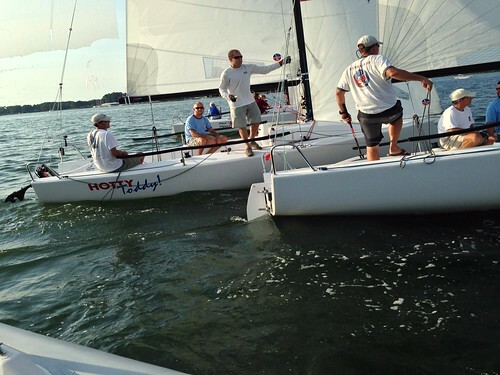 I sailed on J/70 Hotty Toddy with Steve Q, Clark D and Carrie R. With 6 other boats out, overcast skies and winds that started in the mid-teens and were under 10 by the 2nd race – we had a really nice day for racing. With Steve driving the first race and Clark driving the second, we focused on good crew maneuvers and keeping the boat going fast in the right direction. We caught some shifts, missed others but were close enough or in the lead enough times to have some fun with it. Despite some great moments we went 5-4 on the day putting us solidly in 5th. 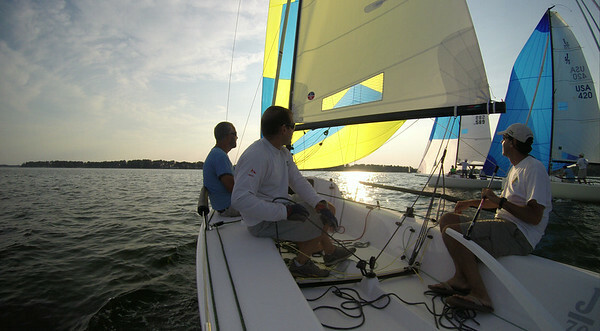 Another beautiful Friday night for some J/70 sailing at Fishing Bay Yacht Club. 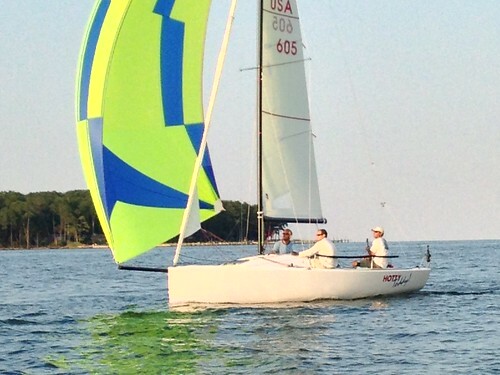 This evening I was sailing with Steve Quiriconi on his new boat Hotty Toddy along with Jerry Latell. Steve and Jerry had been out earlier in the afternoon to get everything setup and tuned and so the three of us got out to the race course a little early to practice some maneuvers. In the 4 races tonight we did pretty well. The very short line made for very tight and late starts, but the shifty winds meant anyone could catch a shift up the beats. We did well to keep up with the leaders and got through our maneuvers pretty well without any major goofs. We even did some gybe sets and a Mexican take down at one point. The final race was 2 laps and then the trip up the channel back to the dock. We were the first boat to legally complete the course and a nice way to end the night and the first time out for the boat.